HomeSmartphonesAndroidHow are mobile apps adding to travel and tourism industry? In the times of smartphone, people might forget anything behind at home or work but not their mobile phones and holding this trait, many businesses are coming up with their online apps on the mobile phone. One such industry which seems to really enjoy its digital journey is travel and tourism. The industry comes in the 7th most downloaded app category and has completely transformed its way of delivery of services. Gone are the days when you had to depend on travel agents to book your tickets or plan your entire trip hour by hour. Now you can get quick online travel arrangements done on the fingertips with mobile apps. An easy tool to attract customers: Online mobile apps have become one of the prime tools to increase the visibility of the business. Many travel biggies such as Yatra.com, MakeMyTrip, or Goibibo.com are successfully running their show by apps. Through apps, they have captured entire new base of elite travellers. They are able to make more business by being able to provide best of services anywhere and at any time. Provision to view pictures and videos of destination: With travel apps in the phone it is very easy and quick to decide on the destination for the trip as travellers can see all the related videos and images of the various destinations in their list and accordingly make better arrangements and planning for the trip. Provision for reservations and checking the availability: Once the destination is final, the various itineraries of it can be checked, the availability of flights and hotels can be looked at, thus, coming close to some conclusion. 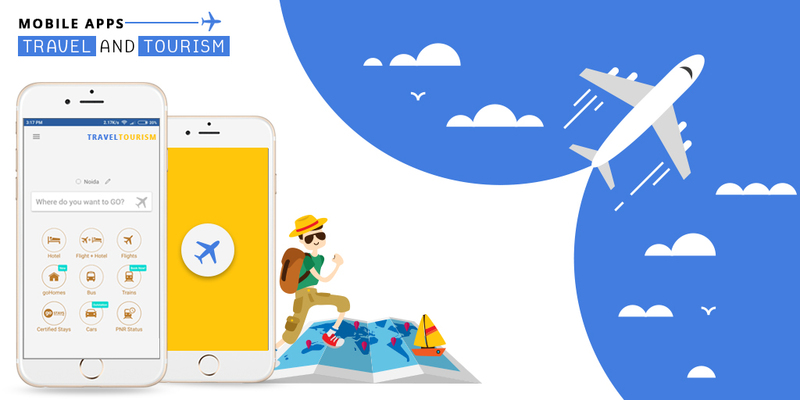 Destination, flights, hotels and itineraries are the major components of a trip and through an app, the traveller gets his own sweet time to decide on these as per his budget. Convenience with customisation: With mobile apps, the entire idea of travelling or going for holidays seems simple. There were days when travellers used to wait for deals or plans to roll out from different travel brands to go for holidays. Now they can plan their trips as per their convenience. They need not go to travel agents office to chalk out the trip plan. Mobile applications give improved experience to users at their place and in time of their comfort only. Contribution to green globe: The best part of these mobile apps is less of paperwork. Soft copies of all the important documents like flight tickets, hotel bookings and etc can be saved on the smartphone. Thus, a very big task of carrying all the documents while travelling comes to an end. Travellers just need to pick their phone, their bag and leave to enjoy the trip. The need to carry a lot of cash while travelling and being unsafe has also reduced. Travellers can easily transfer money from one account to another through the apps. Thus we see how mobile apps have altered the outlook for travel and tourism industry. Guidebooks, compass, maps, and other printed documents have been replaced by apps now. Currently, 80% travellers are using the apps to plan their holidays and if you are in the same business then it is the right time to launch your app too. How to have faster mobile apps?